It’s no secret that one of my favorite guitarists is none other fellow DC expatriate, Paul Bollenback. From his work with jazz legends like the late, great Stanley Turrentine, to the fabulous organist Joey DeFrancesco, Bollenback has become one of the most sought after musicians in jazz. Recently, he has been in the company of one of Australia’s greatest singers, the incomparable Chris McNulty. McNulty demonstrates a finely honed improvisational sensibility delivered with an intense depth of feeling. Long a major jazz singer who has in recent times finally started to gain recognition for her talent, McNulty is one of the foremost singer-composers on the scene today. Her intonation and articulation are commanding and provide a preview for the level of musical excellence and creative artistry. Tonight, McNulty and her Magic Trio come to Healdsburg as part of a tour that brings this trio to the West Coast for the first time. The Magic Trio features McNulty on vocals, keyboard and percussion; Andrei Kondakov on piano, vocals and percussion; and Bollenback on guitar and percussion. The Magic Trio features her versatile, soothing, swimming voice along with her writing and arranging skills and the writing and arranging chops of Bollenback plus his excellent guitar playing. Earlier this year the trio performed for three weeks throughout Russia, including appearances in Moscow, St. Petersburg, and the Ukraine at the first ever Kharkov Jazz festival. They will continue on to London’s premier jazz club, Pizza Express, following their West Coast tour. McNulty first visited New York City in 1985 and settled there in 1988 after being awarded an International Study Grant from the Australia Council. Since then Chris has garnered further accolades from critics, jazz musicians and fans alike. She has collaborated and performed with some of the finest musicians on the jazz scene today including: Gary Bartz, Bollenback, Gary Thomas, Mulgrew Miller, Ugonna Okegwo, John Hicks, Frank Wess, Ingrid Jensen, Terri-Lyne Carrington, Tim Garland, Tom Lellis, Billy Hart, Ed Howard, Jeff Ballard, Dave Pietro, Joe Locke, Peter Leitch, Tineke Postma, James Genus, , Matt Wilson, Jeff Tain Watts, David Fathead Newman, George Mraz, Kenny Washington, Steve Wilson, Joel Frahm, Gary Versace, David Budway, Harvey S and Tony Reedus. In 1990, McNulty’s debut recording in the States, Waltz For Debby (Discovery 1990), received outstanding reviews in several publications and features the official published lyric by McNulty of the great Miles Davis classic, Blue in Green. In 1994 McNulty was also honored to be selected as one of the six exceptional new jazz singers on the New York scene to be featured on the Venus recording, Big Apple Voices. She has gone on to record several CDs since then, A Time for Love (Amosaya 1996), I Remember You (Mop Top 2004- re-released on Elefant Dreams 2006), Dance Delicioso (Elefant Dreams 2005) and her most recent and highly acclaimed Whispers the Heart (Elefant Dreams 2006) which has been included on the Jazz Journalist Assocation’s (JJA) list of Top 10 recordings of 2006. Her development over this period of time from lyricist to full fledged composer has been duly noted in major press reviews and articles. McNulty has maintained an active profile and presence on the international scene as both performer and recording artist since 1991. Her magnetic performances have led to ever increasing festival dates around the world with a touring schedule that includes festival appearances in the UK (Brecon, Wales 2005) Ireland (Kilkenny 2005), Russia, Australia and Belize. In 2002 McNulty toured Russia with Bollenback and appeared in the very first St Petersburg Jazz Festival. They have since returned to Russia for several concert and club engagements. 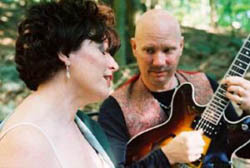 McNulty’s recently completed 2007 global tour featured engagements at The Melbourne Jazz Festival with her ensemble (Australia 2007), Dundee (Scotland 2007), Adelaide, Australia with her Trio Delux project featuring her long time bassist, Ugonna Okego and collaborator/accompanist, Paul Bollenback), as well as the Kaluga Guitar Festival in Kaluga, Russia with Bollenback and Kondokov, once again in Trio Delux format. The tour also included a weekend engagement at London’s Pizza on the Park, culminating in a 5 night engagement at Dizzy’s Coca Cola Club at the Lincoln Center (NYC) (June 2007). Her music has received major recognition on national radio throughout the States, UK, Australia, Ireland, Canada and Europe. Recent major features include Michael Jacobi’s “Raising the Standards” at KRML Jazz Radio as well as Doug Spence’s nationally syndicated program, The Nightly Planet from ABC Australia. McNulty appears as a guest soloist on Bollenback’s Brightness of Being as well as his most recent release Invocation, releasing October 2007. McNulty’s 6th release in the States, Whispers the Heart, features several new outstanding original works and arrangements including a string quartet written by Chris, along with featured guests including jazz great Frank Wess, Ingrid Jensen, Bollenback (Paul also shares executive and co-producing credits), Ed Howard, Dave Pietro, Tineke Postma, Gary Versace, Matt Wilson, Rogerio Boccato and Montez Coleman. McNulty also co-produced a Hip-Hop meets Jazz project with Bollenback and Chapter One. McNulty’s most recent release, Whispers the Heart, has garnered major accolades from the international press and radio as well as being voted one of the top ten releases of 2006 by Jazz Journalists Association’s (JJA) Nancy Barrell. Bollenback’s Invocation remained on the Jazz Week Charts for several months in 2007. As first call guitarist for such jazz great as Joey DeFrancesco, Gary Bartz, and Steve Gadd, Bol lenback’s range and impressive discography speak for themselves. Multi faceted pianist, composer, vocalist, and percussionist Andrei Kondokov is a major jazz star in his native Russia, and currently co-leads the band 5 Corners as well as appearing alongside Russian saxophonist Igor Butman in concert halls and clubs throughout Russia, Europe, and the States. McNulty, Bollenback, and Kondakov together weave a constantly surprising and fresh improvised sound that has been described as being “like children playing”. The Magic Trio, in concert for the first time on the West Coast, is a performance not to be missed.